The couple steals a moment in the Creekside Studio. The New York Times has called Lumberyard in Catskill, “a symbol of the economic transition,” and it couldn’t be truer. That this once-industrial port town warehouse has become a hotbed for avant-garde performance art is an omen of changing times. Since the soft-launch last summer, Lumberyard has welcomed global dance pioneers, local filmmakers, music icons, and aerial acrobats, weaving a varied and complex identity that pulses with creativity. Recently, Lumberyard unveiled yet another aspect of its new DNA. On November 17, the cultural center hosted its very first wedding. The couple, Nikita Paino and Aaron Halbig, were the lucky winners of a wedding giveaway. 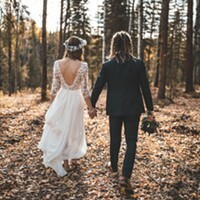 Lumberyard connected Nikki and Aaron with Hudson Valley event planner Moki Pambianchi of Bliss Events to develop a vision for their big day. After the budget, theme, and a color scheme were decided, a handful of Greene County wedding vendors donated their time and services to bring the magical event to life for the couple. 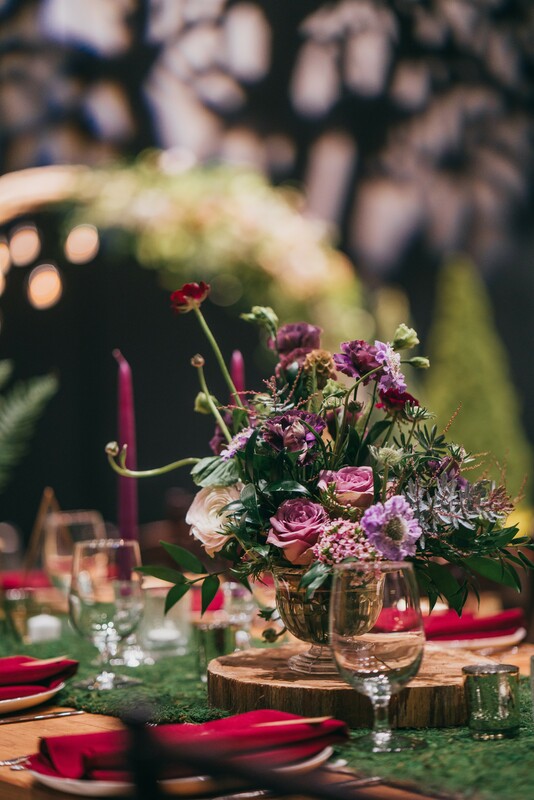 With ethereal visions and a late autumnal color palette of plum, sage, maroon, and forest green, Lumberyard's Theater/Ballroom was transformed into a sylvan wonderland for the Halbig wedding. The couple were joined by 80 of their closest friends and family to celebrate their happy day and the wedding was officiated by the groom's father, Pastor Halbig. 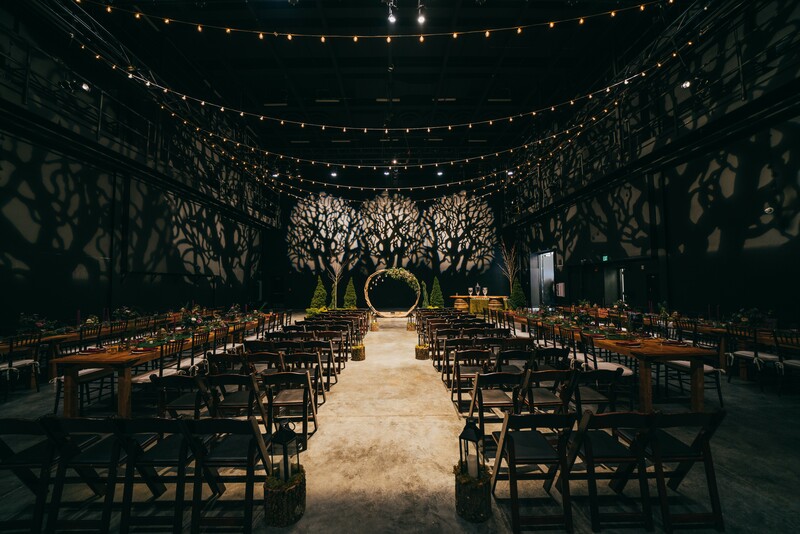 “The Halbig wedding theme drew on ethereal woodland concepts, but for us at Lumberyard, the theme was definitely 'It takes a valley!'" says COO Alison Schwartz. "We were so pleased to work with local vendors who donated their time and services to bring the couple’s vision to life, including extraordinary wedding planning and design by Mokihana Pambianchi of Bliss Events, photos by Joshua Brown Photography, catering by Jeff Loshinsky Catering, floral design by The Rosery Flower Shop; tables, chairs and lighting by Big Top Tent Rental; vintage wagon and various tables by Owl’s Hoot Barn; evergreen trees, plants and shrubs by Story’s Nursery; wedding “Circle” arch by Weathered Wood; wedding cake and deserts by La Patisserie Normande; hair by Doreen’s Hair Salon; makeup by Julia Lombardo; and videography by Turnquist Photography." The newlyweds exit the ceremony in the Theater/Ballroom. 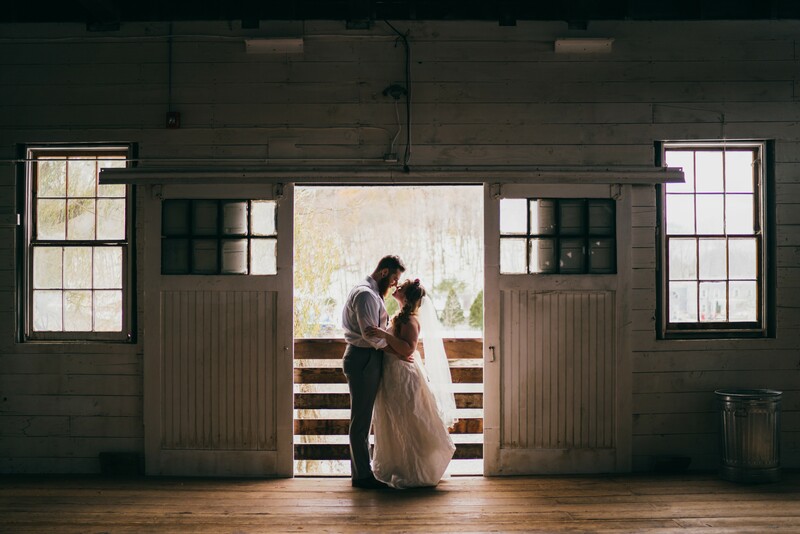 With adaptable buildings, creek frontage, and outdoor space, Lumberyard offers couples a wide range of settings for their wedding ceremony, reception, and photographs. The main Theater/Ballroom is the largest of the ceremony spaces. This industrial-chic ballroom is perfect for large wedding parties and can accommodate up to 600 guests standing or 390 guests seated in a banquet-style table configuration. The adjacent lobby and interior courtyard can also be incorporated into the wedding flow, for example for cocktail hour or photo booth. The Creekside Studio is a large converted barn right on the banks of the Catskill Creek, offering a minimalist, white-and-black color scheme that pairs well with any decor. Some original details have been preserved, such as the rustic wooden beams, while others have been updated for maximum convenience and comfort, including a separate food service area for caterers. You can have both the ceremony and reception in the barn, or if you'd prefer, say your vows creekside, beneath the willow tree. The Creekside Studio can accommodate a party of up to 200 guests standing or 150 seated. You can book either space or do a full property buyout for exclusive access to all 17,000 square feet of event space. In either space, couples are free to find their own vendors and caterers or use Lumberyard's list of local professionals. Recently renovated onsite accommodations mean the bridal party and family members can stay close at hand for all the festivities and preparations from the rehearsal dinner through the post-wedding brunch. 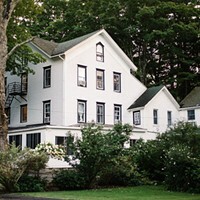 With 13 guest rooms, the property can sleep up to 25 guests. 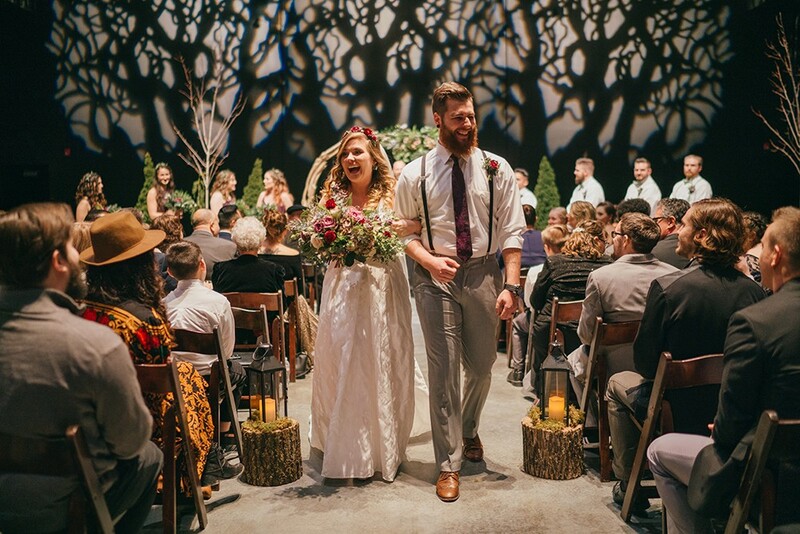 All rental income from weddings is reinvested back into Lumberyard artistic, youth, and community programming, adding a whole new dimension of meaning to your big day. Lumberyard is now booking weddings for 2019. For a pricing quote, email events@lumberyard.org.